This men’s scent was inspired by the city of London. 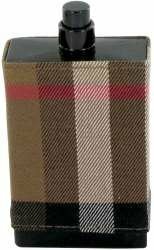 Burberry’s London for Men advertising is made in the same spirit as the one for women’s scent- photo album depicting a walk across busy streets in London. The oriental fragrance includes woody notes, cinnamon, port wine and tobacco with a sensual and lively opening of spices. Top notes include bergamot, lavender, cinnamon and pepper. At the heart, the fruity flavor of port wine is harmonized with leather and mimosa. Its oriental woody base is composed of gaiac wood, oakmoss, tobacco leaves and opoponax resin. London for Men was launched in 2006.